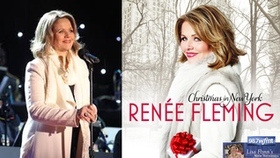 One of the most beloved and celebrated singers of our time, soprano Renée Fleming captivates audiences with her sumptuous voice, consummate artistry, and compelling stage presence. At a White House ceremony in 2013, President Obama awarded her the National Medal of Arts, America's highest honor for an individual artist. Known as "the people's diva" and winner of the 2013 Grammy Award for Best Classical Vocal Solo, she continues to grace the world's greatest opera stages and concert halls, now extending her reach to include other musical forms and media. 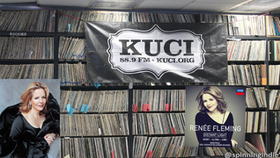 In recent years, Renée has hosted a wide variety of television and radio broadcasts, including the Metropolitan Opera's Live in HD series for movie theaters and television, and Live From Lincoln Center on PBS. She brought her voice to a vast new audience in 2014, as the first classical artist to sing the National Anthem at the Super Bowl. As a musical statesman, Renée has been sought after on numerous distinguished occasions, from the 2006 Nobel Peace Prize ceremony to performances in Beijing during the 2008 Olympic Games. In 2014, she sang in the televised concert at the Brandenburg Gate to commemorate the 25th anniversary of the fall of the Berlin Wall. In 2012, in an historic first, she sang on the balcony of Buckingham Palace in the Diamond Jubilee Concert for HM Queen Elizabeth II. In January 2009, Renée was featured in the televised We Are One: The Inaugural Celebration at the Lincoln Memorial concert for President Obama. She has also performed for the United States Supreme Court and, in November 2009, celebrated the 20th anniversary of the Czech Republic's "Velvet Revolution" at the invitation of Václav Havel. A ground-breaking distinction came in 2008 when Renée became the first woman in the 125-year history of the Metropolitan Opera to solo headline an opening night gala. In the 2016-17 season, Renée brought her acclaimed portrayal of the Marschallin in Strauss's Der Rosenkavalier to the Royal Opera, Covent Garden, and the Metropolitan Opera, in a new production by director Robert Carsen. Her 2017 recital and concert schedule spans the globe, including Budapest, Vienna, Amsterdam, Moscow, Brussels, Paris, London, Madrid, Helsinki, Tokyo, Hong Kong, Beijing, Seoul, Houston, Chicago, and New York. A four-time Grammy winner, Renée won the 2013 Best Classical Vocal Solo Grammy Award for Poèmes (Decca, 2012), a collection of 20th-Century French music, including works composed especially for her by Henri Dutilleux. Her most recent album Distant Light was recorded with the Royal Stockholm Philharmonic and released in January by Decca. It features Barber's Knoxville: Summer of 1915, The Strand Settings, composed for Renée by Anders Hillborg, as well as songs by Björk in new orchestral arrangements. In 2015, she was featured with Yo-Yo Ma on the Billy Childs album, Map to the Treasure: Reimagining Laura Nyro, their track "New York Tendaberry" winning the Grammy for Best Arrangement, Instruments and Vocals. Her first-ever holiday album, Christmas in New York, was released in 2014, and was the inspiration for a special on PBS. In June 2010, Decca and Mercury records released the CD Dark Hope, which features Renée covering songs by indie-rock and pop artists. Her recent opera dvds include Strauss's Arabella and Ariadne auf Naxos, and Donizetti's Lucrezia Borgia. Other recent DVD releases include Handel's Rodelinda, Massenet's Thaïs and Verdi's Otello, all three in the Metropolitan Opera Live in HD series, and Verdi's Traviata, filmed at London's Royal Opera House. 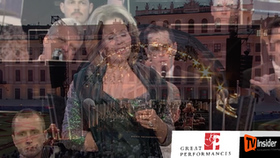 Ms. Fleming's 2010 DVD Renée Fleming & Dmitri Hvorostovsky: A Musical Odyssey in St. Petersburg follows Renée and baritone Dmitri Hvorostovsky to Russia, where they explore and perform in some of St. Petersburg's most historic locations. In recent years, this fourteen-time Grammy nominated artist has recorded everything from Strauss's complete Daphne to the jazz album Haunted Heart to the movie soundtrack of The Lord of the Rings: The Return of the King. She recorded Alexandre Desplat's theme song, "Still Dream" for the soundtrack of the Dreamworks Animation feature, Rise of the Guardians. Her recording honors range from the 2009 Echo Award for Strauss's Four Last Songs to the Prix Maria Callas Orphée d'Or by the Académie du Disque Lyric for TDK's DVD production of Capriccio. In February, 2012, Renée received the Victoire d'Honneur, the highest award conveyed by the French Victoires de la Musique. In 2013, Renée joined with the John F. Kennedy Center for the Performing Arts to present American Voices, a concert and 3-day festival celebrating the best American singing in all genres. 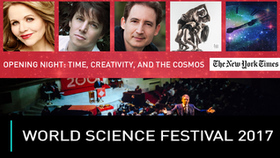 The festival was the subject of a Great Performances documentary on PBS in January of 2015. 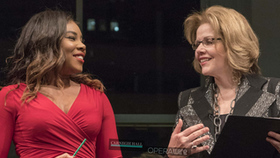 In January 2017, Renée spearheaded a similar cross-genre celebration of singing and community, Chicago Voices, at Lyric Opera of Chicago, with a gala concert telecast on public television. 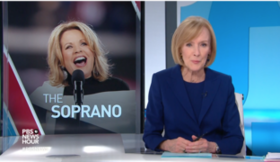 In May 2016, she sang in the National Memorial Day Concert with the National Symphony Orchestra, telecast from the lawn of the U.S. Capitol on PBS. Renée Fleming's artistry has been an inspiration to many other prominent artists, such as Chuck Close and Robert Wilson, whose portraits of her were included in the Metropolitan Opera's 2007 fundraising auction. Two portraits of Ms. Fleming were also created by Francesco Clemente, who revealed one in Salzburg in spring 2007, with the Metropolitan Opera displaying the other in 2008. Photographic portraits include works by Brigitte Lacombe and Irving Penn, among others. In June of this year, the Annie Leibowitz portrait of Renée was added to the permanent collection of the National Portrait Gallery in Washington, DC. Nelson Shank's portrait of Renée in the title role of Rusalka is on display in the portrait gallery of the Metropolitan Opera. 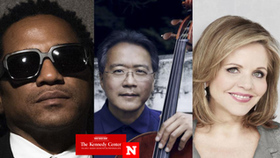 Renée Fleming is a champion of new music and has performed works by a wide range of contemporary composers, including recent compositions by Anders Hillborg, Henri Dutilleux, Brad Mehldau, André Previn, and Wayne Shorter. Among her numerous awards are Germany's Cross of the Order of Merit (2015); the Fulbright Lifetime Achievement Medal (2011); Sweden's Polar Prize (2008); the Chevalier de la Légion d'Honneur from the French government (2005); Honorary Membership in the Royal Academy of Music (2003); and honorary doctorates from Harvard University, the University of Pennsylvania, Duke University (2015), Carnegie Mellon University (2012), the Eastman School of Music (2011) and The Juilliard School (2003), where she was also commencement speaker. 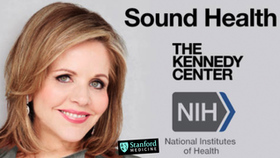 An advocate for literacy, Renée Fleming has been featured in promotional campaigns for the Association of American Publishers (Get Caught Reading), and the Magazine Publishers of America's READ poster campaign for the American Library Association. She was honored by The New York Public Library as a "Library Lion." Her book, The Inner Voice, was published by Viking Penguin in 2004, and released in paperback by Penguin the following year. The paperback edition is now in its sixteenth printing. An intimate account of her career and creative process, the book is also published in France by Fayard Editions, in the United Kingdom by Virgin Books, by Henschel Verlag in Germany, Shunjusha in Japan, Pro Musica Mundi in Poland, and by Fantom Press in Russia. 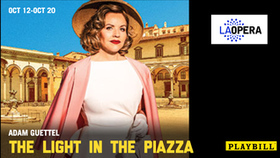 In addition to her work on stage and in recordings, Renée Fleming has represented Rolex timepieces in print advertising since 2001. In 2008, she launched La Voce by Renée Fleming, a fragrance designed for her, with the proceeds benefiting the Metropolitan Opera. Master Chef Daniel Boulud created the dessert "La Diva Renée" (1999) in her honor, and she inspired the "Renée Fleming Iris" (2004), which has been replicated in porcelain by Boehm. Having been added to Mr. Blackwell's best dressed list, her concert gowns have been designed by Reem Acra, Gianfranco Ferré, John Galliano for Dior, Douglas Hannant, Christian Lacroix, Oscar de la Renta, Angel Sanchez and Vivienne Westwood. In June of 2014, the Smithsonian added the gown designed by Vera Wang for Renée's Super Bowl anthem performance to the permanent collection of the Museum of American History. 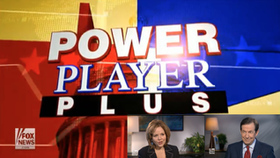 In addition to serving as the face of opera for two public transit campaigns in New York and London, Renée has appeared on The Late Show with David Letterman (famously singing the Top Ten List), The Martha Stewart Show, Spectacle: Elvis Costello with…, The View and Prairie Home Companion as "Renata Flambé," among numerous other media outlets. In 2016, Renée was appointed Artistic Advisor-at-Large for the John F. Kennedy Center for the Performing Arts. She is currently a member of the Board of Trustees of the Carnegie Hall Corporation, the Board of Sing for Hope, the Board of Trustees of Asia Society, and the Artistic Advisory Board of the Polyphony Foundation, which works to bridge the divide between Arab and Jewish communities in Israel by creating a common ground where young people come together around classical music. She is a creative advisor to AIR, the Association of Independents in Radio. In 2010, she was named the first-ever Creative Consultant at Lyric Opera of Chicago, where she is also a member of the Board and a Vice President. At Lyric Opera of Chicago, she curated the creation of a world-premiere opera based on the best-seller Bel Canto for Lyric Opera's 2015-2016 season. A performance of the production was telecast on PBS Great Performances in January. 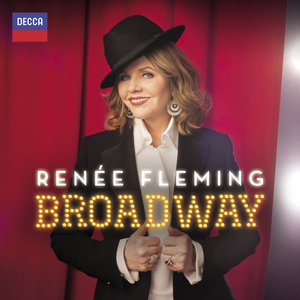 Currently wowing theatre-goers in the US with her Tony-nominated performance in Carousel, Grammy-winning soprano Renée Fleming announces her new album ‘Broadway', to be released on Decca Classics on Friday 7th September. Celebrating musical theatre, the album features a diverse array of great songs for the stage by composers including Stephen Sondheim, Andrew Lloyd Webber, Pasek & Paul, and Rodgers & Hammerstein, as well as a special guest duet with the Hamilton, television and film star, Leslie Odom, Jr.
Fleming made her Broadway musical debut this April as Nettie Fowler in the hit new production of Rodgers & Hammerstein's beloved Carousel. She received glowing reviews and even a Tony nomination – the prestigious awards ceremony takes place this Sunday. The Hollywood Reporter described her performance in Carousel as "superb" and "sheer euphoria", and Newsweek said, "she is divine". 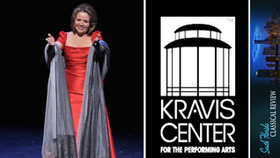 Soprano Renée Fleming returns with a new recital of songs. Her selections include Samuel Barber's famous Knoxville: Summer of 1915 and The Strand Settings, a four-song cycle by Anders Hillborg which was commissioned by Carnegie Hall and is dedicated to Fleming. The recital finishes with three new arrangements of songs by Icelandic singer Björk. Hillborg: The Strand Settings: Dark Harbor XI (5:41) from Renee Fleming - Distant Light on Decca is the WFMT: Chicago - Featured New Release for FEBRUARY 3, 2017. 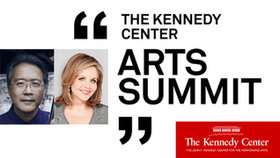 Crossover Media artists - Cellist Yo-Yo Ma and soprano Renee Fleming will host the Kennedy Center's Arts Summit. 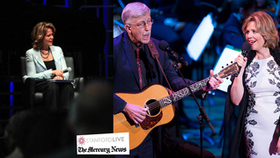 The center announced in a news release Thursday that its annual summit designed to bring leaders from the arts and related fields together will be held April 25. The summit is being presented in collaboration with the Aspen Institute Arts Program and Seattle-based Citizen University. The center says this year's summit will serve as a blueprint for the Kennedy Center's celebration of President John F. Kennedy's 100th birthday. The summit will focus on the idea of citizen artistry and using the arts to make positive change in people's lives. The center says participants will examine the idea and possible applications in today's society through ideals Kennedy set forth: innovation, creativity, courage, community service and social justice. 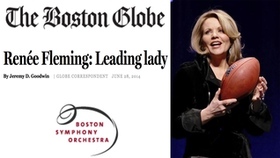 The afternoon of last year's Super Bowl, Renée Fleming was in a familiar place - onstage at Boston's Symphony Hall, performing a selection of arias in a Celebrity Series concert. When the Seattle Seahawks and Denver Broncos met in February for this year's title game, she was a little closer to the action - on the field, in fact, singing "The Star-Spangled Banner" for assembled fans and a television audience of well more than 100 million viewers. It was a milestone. The popular soprano, often nicknamed "the people's diva," was the first classical singer ever to nab that most populist of assignments. Afterward, the Smithsonian's National Museum of American History acquired the Vera Wang gown she wore. "You would think they would want someone who would get phenomenal sales as a result of this," Fleming says. "A classical musician would not be that person. Red Hot Chili Peppers? Maybe, yeah." But she's used to bumping against the boundaries that often keep her peers penned up in a gated musical community, set off from a pop culture where the gaudy, highly ornamental vocal style rewarded on television shows like "American Idol" seems de rigueur. (She says she received a ton of mail after the Super Bowl, much of it from viewers who thanked her for "singing it straight.") She's known for a broad taste in operatic repertoire, having sung more than 50 different roles to date. But she also has much affection for show tunes, and in 2010 released a pop album that featured material by Arcade Fire, Death Cab for Cutie, and Leonard Cohen. As the featured soloist for the opening-night Boston Symphony Orchestra concert at Tanglewood on July 5, she'll sing Samuel Barber's wistful "Knoxville: Summer of 1915" before turning to a selection of Broadway favorites from "The Sound of Music," "South Pacific," and other shows. READ THE FULL Boston Globe ARTICLE. 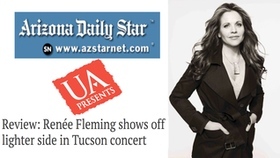 UApresents closed its 2013-14 season Sunday with soprano Renée Fleming making her first Tucson appearance in a dozen years. But her concert at Centennial Hall was not all arias and serious vocal muscle flexing. It was fun, sometimes downright giddy, with some fanciful Mozart to open the night, a pair of Rachmaninoff love songs, a handful of French love songs and Kurt Weill's made-for-Broadway-and-Hollywood lament "Foolish Heart." This was a program of cherry-picked songs mined from operas and song cycles including Rachmaninoff's "Twelve Romances" and "Songs of Simeon"; Handel's "Samson" and "Semele"'; and Dvorák's "Gypsy Songs." A trio of French love songs was punctuated by the sassy Canteloube folk tale "Wretched the Man Who Has A Wife," which Fleming performed with a wink-wink. READ THE FULL Arizona Daily Star REVIEW. Opera superstar Renee Fleming sits down with the Classic FM's Jamie Crick to discuss vocal technique, inspiration behind her new album Guilty Pleasures, and what makes Opera a unique art. Renée Fleming is unique not only for her radiant voice and masterful technique, but also for the exceptional stylistic diversity and musical curiosity that distinguish her career. It's difficult to imagine any other artist today possessing the sense of adventure needed to gather together the wide-ranging collection of arias and songs heard on this disc. 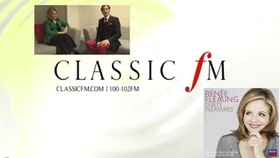 After her previous album, Poèmes, with its focus on French concert repertoire, Fleming has gone in an altogether different direction, giving herself the joy of musical cherry-picking. Singing in no fewer than eight languages, both opera arias and songs, the soprano is presenting music she views as "guilty pleasures". "Some of these treasures are culled from larger works - there is the guilt! The pleasure, of course, is the chance to revel in the unabashed beauty that is the shared attribute of these melodies and their texts." The programme's operatic portion takes Fleming far off the beaten track, the result being several marvellous discoveries for her listeners. Two of the arias were inspired in large part by her fascination with comparing different composers' treatment of the same character. Consider, for example, the sorceress she has portrayed so successfully in Rossini's Armida; here she revisits that heroine, as depicted by Dvořák in the last of his ten operas. Armida's lovelorn entrance aria represents the apotheosis of the Czech composer's matchlessly fervent lyrical style. Dvořák'sRusalka, another Fleming signature role, has an exact counterpart in Tchaikovsky's Undina. Having written the opera of that name when still in his twenties, Tchaikovsky destroyed his score four years later. Five excerpts survive, although they remain unfamiliar to the public. How fortunate, then, that Fleming has resurrected Undina's aria, the sweet, open-hearted reflections of a character who - like Rusalka - is a water nymph longing for a soul. There is more Slavic repertoire to savor, including another Czech gem. In Smetana's "folk opera" Hubička(The Kiss) the protagonist is a strong-willed young woman, Vendulka, who refuses to kiss her fiancé, the widower Lukáš, until they're married. One of the role's more intimate moments is the lullaby Vendulka sings to Lukáš's baby. The melody is actually an original folk tune appropriated by the composer, communicating a disarming simplicity befitting the story. Turning to Russian song literature, Fleming performs Rachmaninov's "Sumerki" ("Twilight"), one of twelve incomparably expressive songs comprising his Opus 21. This is Rachmaninov in a restrained mode: he employs simple stepwise motion and ascending arpeggios in the vocal line to maximum effect in summoning the image of the solitary young girl gazing into "the boundless azure of the darkening sky". The disc's single Italian-language track is Refice's Ombra di nube, one of the most haunting of all Italian art songs, definitely deserving greater favour among today's audiences. (Has any song composer ever more eloquently conveyed humanity's longing for peace and serenity?) It is familiar to many historically minded listeners through a recording by the legendary Claudia Muzio. An artist of the more recent past, Victoria de los Angeles, was a source of inspiration for Fleming when planning her programme - particularly with reference to two of Falla's Seven Popular Spanish Songs, "Canción" (lovesick in its text, yet lively and in a major key) and "Nana" (a setting of the tender Andalusian lullaby sung to the composer in his childhood); and also "Villanelle," Berlioz's sunny opening song of his cycle Les Nuits d'été.Still more effervescent in tone is Delibes's "Les Filles de Cadiz," with its irresistible bolero rhythm and spicy text. Fleming contrasts those two French pieces with another, Duparc's Phidylé, a supreme test of legato and a singer's ability to build slowly from profound intimacy to rhapsodic expressiveness. Fleming adds that the beauty of this vocal writing heightens her disappointment that Duparc destroyed his operatic version of Roussalka. The French selections also include what has in recent years become the world's favorite soprano–mezzo duet - the intoxicating "Dôme épais" from Delibes's Lakmé, for which Fleming is joined by her cherished colleague and friend Susan Graham. Onstage the pair's artistic rapport has been gloriously evident in Der Rosenkavalier, Le nozze di Figaro, andAlcina. The Lakmé duet figured prominently in a greatly acclaimed, all-French recital they performed in a tour to six American cities during the 2012–13 season. Fleming has no plans to sing Wagner's Isolde, but this disc provides the next best thing: "Träume," a study for Tristan und Isolde's love duet. In every phrase the song's depth of feeling reminds the listener of Wagner's passionate attachment to the author of this text, Mathilde Wesendonck. For her second German-language selection, Fleming turns to the realm of Viennese operetta - specifically, Walzer aus Wien, a stage hit of the 1930s more famous in its English version, The Great Waltz. For this work Julius Bittner and Erich Wolfgang Korngold (the latter known not only for his powerful, haunting opera Die Tote Stadt and brilliant film scores, but also as one of the greatest orchestrators of the twentieth century) adapted the melodies of Johann Strauss, Jr., to accommodate a plot based on that composer's own life. "Frag mich oft" presents a deeply soulful melody in an arrangement abounding in sheer sensuous appeal. The sentiment expressed here, too, is captivating - essentially, "If I had to do it over again, I'd choose to be a musician again." Orchestration that Fleming considers "ravishingly beautiful" lured her to two of the Chants d'Auvergne, the folksong collection arranged by Joseph Canteloube to texts in Occitan (the language of southern France's Auvergne region). Sombre yet tonally lush, "La delaïssado" sets before the listener the abandoned girl whose only company now is the evening star. Creating the greatest possible contrast is a delicious piece of folk wisdom, "Malurous qu'o uno fenno." The song proclaims that both the man who wants a wife and the man who doesn't are unhappy. The wife who has her man is happy, but even happier is the woman who needs no man at all! This programme would be incomplete without English-language repertoire. Early in her career Fleming created Countess Almaviva in the premiere of John Corigliano's The Ghosts of Versailles at the Metropolitan Opera. Deeply moved by Teresa Stratas's portrayal of the anguished French queen Marie Antoinette, Fleming is thrilled to have an opportunity to explore this character and her music. The queen has her moment of catharsis in a powerful monologue near the end of the opera, demanding exceptional range, variety of colour and emotional intensity. The other English-language selection contrasts notably with Corigliano's full-blown drama. A touching simplicity imbues Danny Boy with an appeal that has made it one of the most recognisable and beloved melodies in the world. 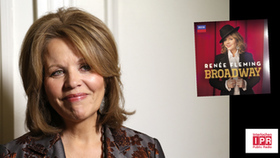 What a joy it is for listeners to be guided by Renée Fleming on this musical journey. To the entire program she brings her treasurable musicality, limitless interpretative insight, and of course, that uniquely beautiful voice. Roger Pines, dramaturg and broadcast commentator at Lyric Opera of Chicago, writes frequently for recording companies and major music publications internationally.